Posted on Sun, Oct 24, 2010 : 6 a.m. I used to work in a cemetery. It's one of those somewhat interesting footnotes in my life that seems so far removed from my current life that I often forget about it. But when I do remember, especially in the company of others, I can sound — at times — much more interesting than I usually am. There are a surprising number of stories that take place in a cemetery. I can tell stories about how graves aren't actually 6-feet deep or what happens to headstones when there are typos on them. I can tell stories about the cemetery regulars, the father and daughter who show up near-daily with lawn chairs in tow, or the surprisingly attractive bikini-clad young woman who would visit her grandparents' graves and then sunbathe between the stones. Some of the stories are humorous or ridiculous, like the ones involving people stealing flowers from one grave to put on another. And some of them are heartbreaking, such as the times when we had to remove the toys and mementos that parents were leaving on their children’s graves. But mostly it was just a job. In fact, it was one of the best jobs I ever had: outdoors in the summertime, never really an urgency to do anything, and more than anything else, it was quiet and peaceful. This is all to say that I've spent more time in cemeteries than most people will in a lifetime, and not only am I not saddened by them, I seek them out like roadside attractions. I've been known to drag girlfriends through seemingly abandoned graveyards to look at the dates and etchings on century-old stones. Sure, many people will visit cemeteries of people they know, or of famous ones such as PÃ¨re Lachaise in Paris, but to me, they're not just sacred ground, they're personal in a way that is less morbid than it is therapeutic. Which is why I was so delighted to stumble upon Fairview Cemetery, nestled along the Huron River just north of campus and downtown. Closing the trail meant I had to run an extra 50 feet up Broadway before turning onto Swift and weaving my way back to the river. As a runner, you’d think such a detour would be welcomed, but I’m a creature of habit, and so it wasn’t, and for the first few weeks I made a beeline to the river, surely grumbling under my breath. 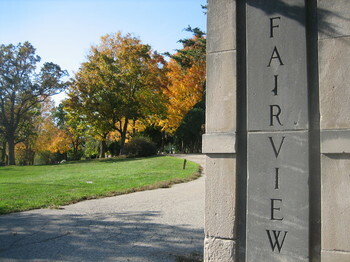 That is, until one day I kept running on Wright till it reached a dead-end, literally: Fairview Cemetery. 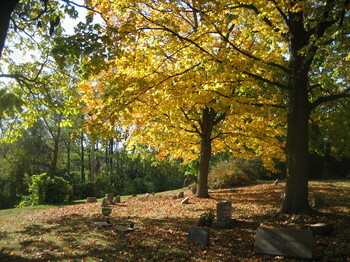 Once inside the stone entryway, one is greeted by a peaceful tree-lined, park-like small cemetery, ringed by broken asphalt and gravel paths that are currently buried beneath brilliant yellow and orange leaves as the trees give up their final breath of the season. Squirrels frantically skitter over the hardening ground and rest on odd headstones to gnaw on acorns as they watch visitors slowly make their way around the tiny circuit. Though some of the headstones are more recent than others, there seem to be very few visitors on most occasions. People can pull their cars right up alongside the plots, as I’ve even seen a family leave the car running as they take some time to reflect before putting it back into drive. If it weren’t for the fact that everything apart from the trees and squirrels were dead, this could be considered living history. I’ve spotted stones as old as the 1830s, and some are so weathered and cracked that you can’t even read them anymore. There are markers of names that will sound familiar to any Ann Arbor resident. There’s a civil war memorial from the 1870s recognizing the young Ann Arbor men who fought for the Union. And in the far corner of the cemetery, there is a large black headstone sticking nearly 3 feet into the air, on one side the University of Michigan seal, and the other a large block M. Around this stone there are a few dozen stones, simply etched with dates, going as far back as 1915. Here the remains of nearly a century’s worth of people who donated their bodies to science at U-M huddle as a final reminder that even the living rely on the dead to keep going. As you make your way around the cemetery and head back toward the entry gate you feel the ground underneath you rise and fall from decades of mourners’ car tires. The traffic from beyond the walls sounds distant, as if you’re protected in this space. And the newly fallen leaves crunch underfoot. Especially this time of year, a cemetery gives the opportunity to recognize the seasonal mortality of our surroundings, as autumn turns to winter and we inevitably march on, perhaps only leaving the cemetery to circle back sooner than we think. But before you consider that a depressing thought, consider this. Within the past week I’ve heard about two people from my high school years who died and that I’ll never see again even though I envisioned years in the future where we could run into each other and reflect. Last week I saw the body of a dead man on Washtenaw Avenue, only moments after he was fatally struck by a car. These were jarring instances that seemed suddenly too real. They affected me — as they would anyone — but yet, they were somehow impersonal. Safely behind a phone-call, a newspaper, or in my car, these deaths were final, but somehow incomplete, and so I could choose not to deal with them just yet. But during this time, I drove down to New Boston to visit my grandparents’ graves. As usual, once I found their headstone after yet another search, I teared up a bit. But unlike most other times, I didn’t cry. And I really wanted to. But there were other mourners there, literally pouring dirt over a newly-lowered casket. When I saw them I felt bad, because I felt like I was intruding in their private moment. And of course, I was. But the real reason I couldn’t concentrate on my crying was because they were intruding on me in a way. Each time I had visited before I had been alone, and had been free to show my emotions or talk to the hard ground as much as I pleased. But not today. It was then that I realized why I appreciate cemeteries so much: I can be alone. Once inside, I am the embodiment of the present tense standing high above the past. Cemeteries are the one sane place that our species has created for uncontested introspection. We can be alone and we can be aware of ourselves. It’s the same reason I run, I think: To separate myself from everyone and everything else in my day-to-day life, to really feel (even when I’m in pain) my living, breathing body rise up and fall back to the hard ground stride by stride. I’m alone, I’m self-aware, and I can think, seemingly with a clarity impossible at any other point during my day. So when the Argo Pond trail re-opened recently I resisted going back to my previous route, instead running over the bridge and up the hill toward Fairview. 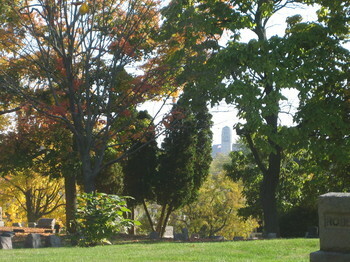 Once there, the golden and apple-red leaves of the cemetery Maple trees fluttered down over silent graves, and all along the perimeter of the aging path, I was able to slow down to a trot and feel at peace for just a few minutes, acutely realizing that I was there, and that that was enough. Chris Gerben writes about spaces on and around U-M where the campus meets the city. He can be reached at a2cgerben@gmail.com.